The Willson Heart Center at Valley Children’s is a leader in the diagnosis and treatment of congenital and acquired heart disorders. The Center is at the forefront of bringing improved techniques and advanced cardiovascular care to kids in Central California. Our cardiothoracic surgeons perform the full range of surgical procedures, from repair of routine septal defects to complex repairs of all forms of single ventricular malformations, including Norwood procedures for hypoplastic left heart syndrome. 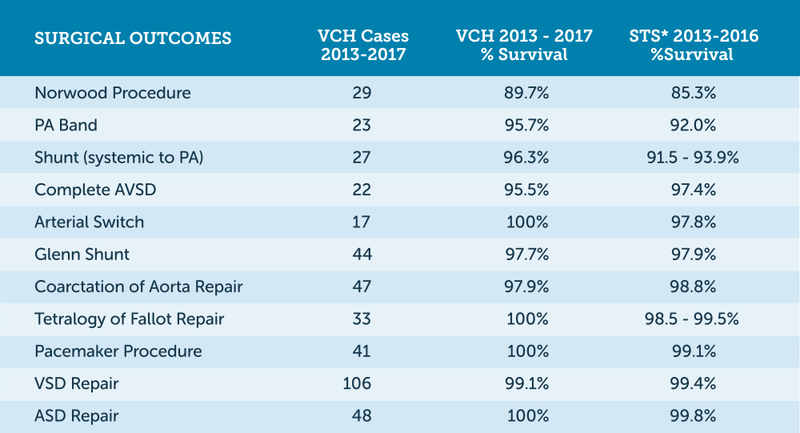 Cardiothoracic surgery survival rates at Valley Children's are similar to -- and in many instances, better than -- the Society of Thoracic Surgeons reported composite outcomes. *STS– The STS Congenital Heart Surgery Database (CHSD) is the largest database in North America dealing with congenital cardiac malformations. The CHSD contains more than 435,000 congenital heart surgery procedure records and currently has more than 900 participating physicians, including surgeons and anesthesiologists.